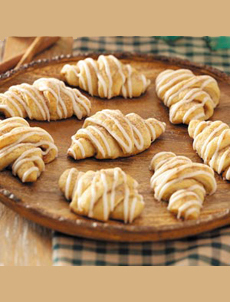 April 10th is National Cinnamon Crescent Day. Crescent is the English word for croissant, the buttery, crescent-shaped laminated dough breakfast roll (there’s more about croissants below). Make your own with this recipe from Taste Of Home. 1. COMBINE 3 cups flour, yeast, sugar and salt in a large bowl. 2. HEAT the butter, milk, shortening and water to 120°-130° in a large saucepan. Add to the dry ingredients and beat just until moistened. Add the egg yolks and beat until smooth. Stir in enough of the remaining flour to form a soft dough (the dough will be sticky). 3. TURN the dough onto a floured surface; knead until smooth and elastic, about 6-8 minutes. Place in a greased bowl, turning once to grease the top. Cover and let rise in a warm place until doubled, about 1 hour. 4. 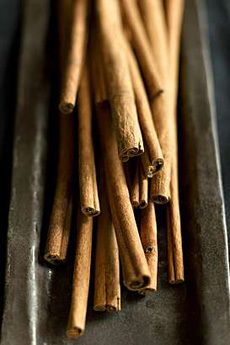 COMBINE the sugar and cinnamon in a small bowl; set aside. 5. PUNCH the risen dough down. Turn it onto a lightly floured surface; knead about six times. 6. DIVIDE the dough into four portions. Roll out one portion into a 12-inch circle; spread with 2 tablespoons butter and sprinkle with 2 tablespoons cinnamon-sugar. Cut into 12 wedges. 7. ROLL up each wedge from the wide end and place it point side down, three inches apart on ungreased baking sheets. Curve the ends to form crescents. Repeat with remaining dough, butter and cinnamon-sugar. Cover and let rise until doubled, about 45 minutes. Preheat the oven. 8. BAKE at 350°F for 15-20 minutes or until lightly browned. Remove to wire racks. Make the glaze: Combine the confectioners’ sugar, milk and vanilla; drizzle over warm rolls. Combine the sugar and cinnamon; sprinkle over the rolls. Meaning “crescent” and pronounced kwah-SAWN in French, this rich, buttery, crescent-shaped roll is made of puff pastry that layers yeast dough with butter—a technique known as laminating. Traditionally a breakfast bread served with jam and butter, two classic variations include the almond croissant, filled with frangipane (almond paste) and topped with sliced almonds, and the “chocolate croissant,” correctly called pain au chocolat, baked with a piece of dark chocolate in the center. There’s also the Bavarian croissant or pretzel croissant, made of a pretzel-like dough that combines bread flour and whole wheat flour with salt sprinkled on the top, like a pretzel. Some are made of puff pastry, others of a soft pretzel-type dough in a triangle wrap, like a croissant. Stories of the croissant being made in the shape of the crescent of the Turkish flag, after the defeat of the Turks in the Siege of Vienna in 1683, are a perpetuated myth. Recipes for croissants do not appear in recipe books until the early 1900s, according to the Oxford Companion To Food. The earliest French reference is in 1853. The croissant is descendant of the Austrian kipfel, a yeast roll usually filled with chopped walnuts, dried or candied fruit, or other filling, and shaped like a crescent. It arrived in Paris in 1838 or 1839 with August Zang, an Austrian military officer. He opened a bakery, Boulangerie Viennoise, and introduced Viennese techniques which would one day lead to the baguette and the croissant. The crescent-shaped kipfel was ultimately made with puff pastry by French bakers. You can read this history in Jim Chevallier’s book, August Zang and the French Croissant: How Viennoisserie* Came To France (Kindle edition). *Viennoiserie are buttery, flaky breakfast breads and pastries made with laminated dough, a technique of layering and folding a yeast dough to create brioche, croissants, danish, pain au chocolat and other so-called “Viennoiserie.” It is a marriage between traditional bread baking and sweet pastry baking. The technique of lamination produces many buttery layers that can be pulled apart to reveal thin leaves within. You can see the striations, or layers, of pastry when you look at the top of the Viennoiserie or when you cut into them. This technique is time-consuming and expensive (because of the amount of butter needed).